Talk to us today about your Face or Body lift treatments. How is a Face Lift done? Incisions are made usually above the hairline at the temples, extending to­wards the natural line that continues behind the earlobe to the lower scalp. Muscles are tightened by various techniques. Extra skin is then removed and wounds closed. Qualified surgeons from the UK our surgeons have an average of 15 years experience and are the best breed available in the UK. There isn’t usually significant discomfort after surgery. If there is then it can be lessened with the pain medication. Rhytidectomy – How is it done? Incisions are made usually above the hairline at the temples, extending to­ wards the natural line that continues behind the earlobe to the lower scalp. Muscles are tightened by various techniques. Extra skin is then removed and wounds closed. Depending on what method of anaesthetic is used; either general or local plus sedative. It’s suggested the patient to be kept in for 1 or 2 days. By the 3rd week you will look and feel much better. Most people are back to work in about 10 days to 2 weeks after surgery. You may be bruised but special camouflage make-up can be used to cover it up. Eyelid surgery is a surgical procedure to remove fat along with excess skin and muscle from upper and lower eyelids. Eyelid surgery can correct dropping upper lids and puffy bags below your eyes. 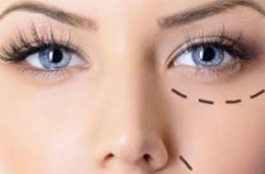 Where is Eyelid Surgery done? Incisions are made following the natural lines of your eyelids, in the creases of your upper lids and just below your lashes in the lower lids. Working through the incision we separate skin from underlying fatty tissue and muscle. Remove excess fat and often trim sagging skin and muscle. The incisions are then closed with very fine stitches. It is performed on an outpatient basis under local anaesthesia and light sedation. After as with any surgical procedure you can feel discomfort and be bruised and swollen. Usually there is no need to stay in hospital as the procedure is performed with local anaesthetic. Most people are ready to go out in public in a week to 10 days. After stitches are removed you’ll be able to wear makeup. Eyelids will remain slightly pink for 6 months or more and eventually fade in to a thin nearly invisible white line. What is reshaping chin and cheeks? Reshaping chin and cheeks is a surgical procedure that balances these features of the; face, particularly the nose, Chin and the cheekbones. What area can it be done on? Jutting chins and flat cheekbones. The surgery is usually done with general anaesthetic. Therefore while having the procedure you will not feel discomfort. 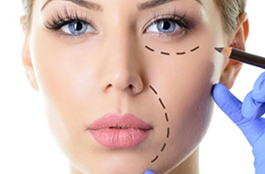 What does reshaping chin and cheek surgery involve? Removing some of the chin-bone and recessive can reduce a jutting chin can be built out either by sliding the chin forwards or by inserting an implant on the bone. A small cut is made in the groove between the lower lip and the gum though if an implant is used. The surgeon may advise that the cut is made in the natural crease under the chin. Flat cheekbones can be built out by inserting implants over the cheekbones usually through cuts that are made inside the mouth where the cheeks join the upper gum. The surgery is usually done with general anaesthetic. Therefore while having the procedure you will not feel discomfort. After the procedure for a couple of days you may experience discomfort and soreness inside your mouth. Pain is controlled with medication prescribed by your surgeon. General aesthetic usually requires an overnight stay in hospital. You will need at least a week off work. Ear surgery is usually done to “pin the ears back” or to reduce the size of large ears. Also split ear lobes can be repaired. The common technique is the surgeon making a small incision in the back of the ear to expose the ear cartilage. Ears may throb or ache a little for a few days but can be relieved by medication. The common technique is the surgeon making a small incision in the back of the ear to expose the ear cartilage. He then sculpts the cartilage and bends it back toward the head. Non- removable stitches are used. Adults and children are usually up and around within a few hours of surgery, although you may prefer to stay overnight in the hospital with a child until the general anaesthesia wears off. Most adults can go back to work in about 5 days after. Children can go back to school after around 7 days as long as they are careful with playground activity. Helps to reduce the appearance of sagging, flabby jiggly arms. 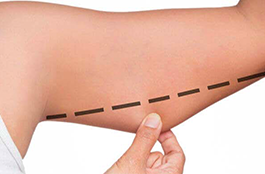 Arm Lift surgery is a procedure done on the upper arm. Arm Lift surgery involves incision made on the upper arm to remove excess skin, pro­viding a sleeker, slimmer, toned shaped arm. As with all surgical procedures, you can feel some discomfort, pain killers are given to help ease the pain. How long will I need to stay in hospital for? The procedure is carried out with General Anaesthetic so usually an overnight stay is required. Qualified surgeons from the UK, our surgeons have an average of 15 years experience and are the best breed available in the UK and this procedure will be done in a hospital. Would there be any scaring? 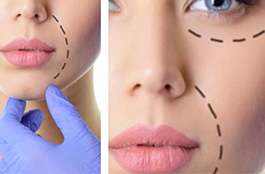 The surgeon will seek to conceal any incision lines within natural contours, although some scarring may be visible and all scars are permanent. Scaring can take around a year to fade from red to white. We advise patients to take 2 weeks off work and to avoid heavily lifting or driving for 4 weeks.